A Celebration….20 paddle days so far this season! | Vermont Paddle Pups! A Celebration….20 paddle days so far this season! In celebration of our 20th day out in the canoe(s), we post a short video of this morning’s paddle. Accompanied by Gram, we had a lovely paddle in quiet, peaceful waters. A stop for coffee was delightful, the sun warming us , and the clouds passing in a mosaic of white. 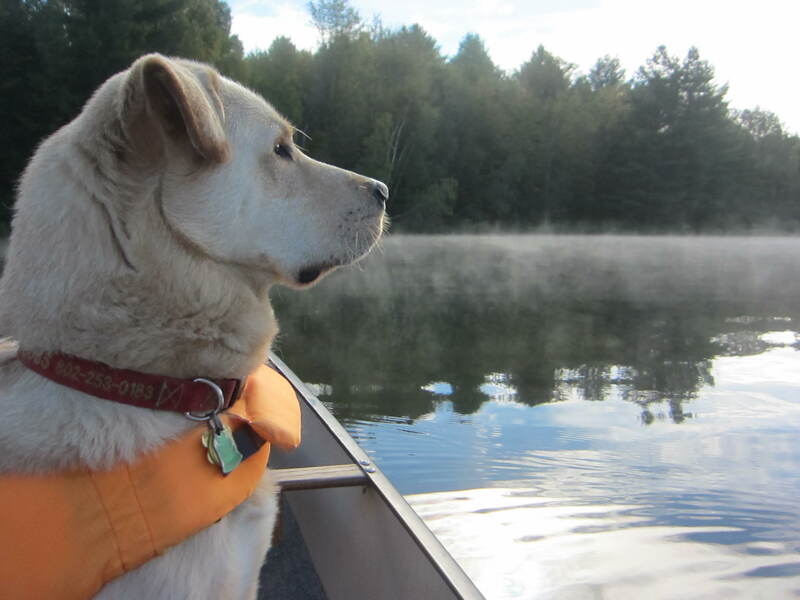 It is amazing how far Edgar has come since May….today, we were startled by 2 dogs running down a trail and into the water, a mere 20 feet from our canoe. A few months ago, we would have been “in the drink”, and Edgar would have been happily swimming off with his new found K9 buddies. Not today…Edgar and Griff were alert and interested, but they stayed seated calmly, to our grateful praise. The season will end in about a month; we are hoping for some warm, clear, brilliant foliage paddles to wrap up a wonderful canoe season.